.. at long last. Geez this business has kept me so busy since getting back that I had no time to stamp at all, till yesterday that was. I was chomping at the bit to get back into it, but having had nearly 4 weeks off showed and I was very rusty to start with. I played with a old and favourite set and after the first attempt ended up in the bin, the second one was somewhat improved. Hydrangeas are my most favourite flowers( you know me anything to do with spheres, domes, rounds), lots of perfect tiny flowers packed tightly in a perfectly round dome, just lovely. So this set was a must have straight away and I have use it to death. Is the one I reach for any time I am not sure what I will use. 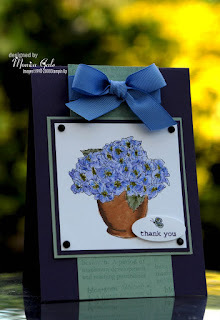 Colours on this card are Elegant Eggplant, Sage Shadow and Brocade Blue. I have coloured the image with my markers ( have you placed your order for a chance to win a free set? ), and the ribbon is Brocade Blue wide grosgrain. Sentiment from Oval All set, and focal image belongs to the wonderful Bloomin With Beauty. Made a few more but you will have to wait for them. 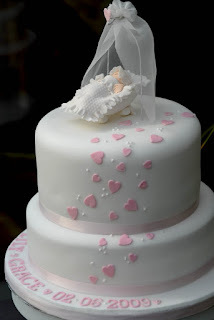 I have another cake to share though, Again it was a Christening cake to go with those invites . You really get the complete package when you come to me LOL. The bottom layer was rich fruit, and the top pink sponge with vanilla butter cream. A bit more traditional this one the parents wanted a keepsake so that's why they choose the crib. What a beautiful card Monica and that cake looks scrumptous!!! oh Monica. that cake is absolutely stunning! Love the invites too that it goes with. what a fab idea. Soooo yummy! your cakes are fab! Oh Monica what can I say, lovely card and absolutely stunning cake! Such an amazing cake Monica, such a talented lady. Beautiful card Monica as always, the colours are FAB, I can't believe you had to throw one away.... That cake is absolutely GORGEOUS!! Your card & cake are lovely. 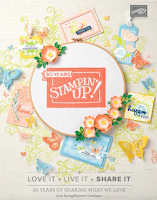 This is one of my favorite floral stamp sets!